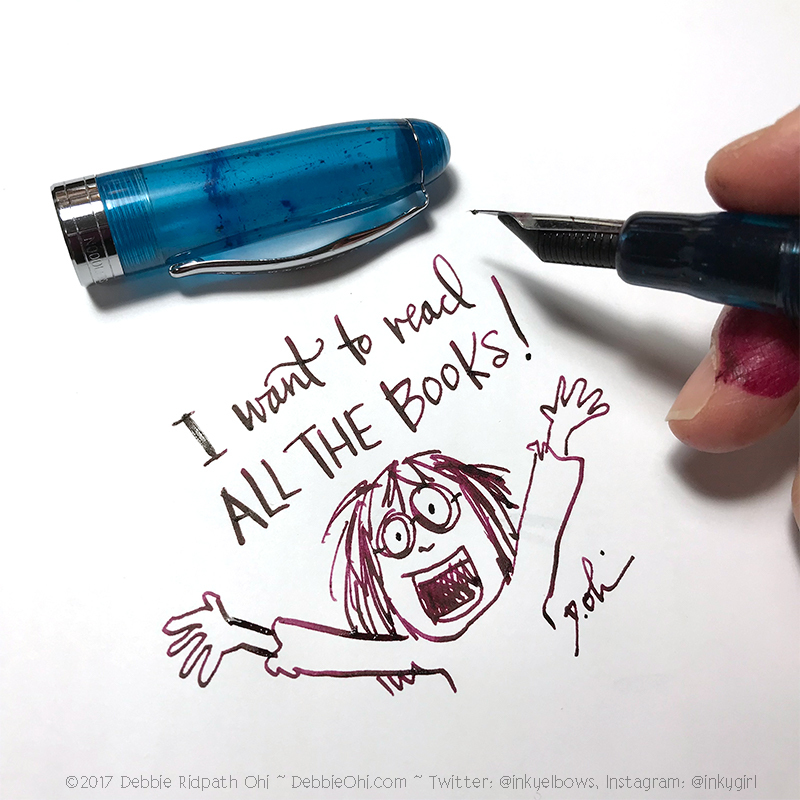 → Need Advice: Leaky Fingers From My Noodler's Ahab? I'm pleased to find out that you did not have a case of "leaky fingers", but a leaky pen. What kind of pen is it? Cartridge? Piston fill? Lever and sac? Can you detach (unscrew) the section from the barrel? If so, the silicon grease goes onto the grip section's threads. The other possibility is a crack in the threads-- Ugh! Debbie: I've had the same issue with my Ahab and no amount of silicone grease would keep the ink at bay. For this reason, I am 'paying it forward' in the other forum and donating it to a student or newbie to the hobby who wishes to tinker around with it. The sort of converter in the Ahab us treaded and is perhaps not tightened enough. So I would suggest trying silicone grease on both the converter and where you thread the section and barrel together. See if that works. +1 to Cap_Mlam- comment (cracked me up) Noodlers Ahab was my second pen. It did the same thing. Over and over. I tried everything and eventually gave up. Heat setting the nib helped some my leak was from around/above the nib. But no matter how much I greased it and repositioned it, changed nibs, - same result. About once a year I give it a new try. One of these days we’ll get it! TWSBI was my follow up and i never looked back! The trade off with the Ahab is you get that massive ink capacity when you use it as an eyedropper pen, but that massive incapacity can often end up everywhere else that you don't want it, as well as on the paper. Noodler's pens are unfortunately meant to be tinkered with, and I pretty much lost patience with both of the Ahabs that I have, one for writing and 1 for drawing, for the very same reason you describe. Heat setting the nib works well, so does adding an O ring to the seals on top of silicone grease, but I've also been much more satisfied with the Noodlers Konrad, despite its smaller ink capacity, because it just leaks less. I will say that the Ahab DOES behave after you spend enough time messing with it, but it does take a lot of messing with. Unfortunately, at least during the era that I bought them, there were some quality control issues so the threading was not always the most reliable. Sounds discouraging, doesn't it? Good luck! Thanks for the helpful suggestions, all. It does sound like the Ahab is going to need more tinkering than I am capable (in terms of patience)! I too encountered the same problem. I try to keep my second finger far enough away from the edge of the, I think it is called, barrel. Once it goes over the ink is on my finger. Once I found a puddle of ink on my paper having no idea where it came from. I use this pen for travel and keeping short notes and that is all besides my continuing writing practices. Same here, I have a beautiful King Philip Ahab, tried everything too. Got new converters but no matter what I do is always burping, liking etc...I haven't gave up on it just yet, but I love how it looks every time I take it out and write with Black Swan in Australian Roses which goes very well with this special edition Ahab, people seem to be mesmerized by it. I have always prefered the quality of Noodler's Konrad for flex pens. Also FPR makes a great superflex. Never had these issues with either that I can remember. Twsbi is also a great pen that you will use for a lifetime regardless of your level. my ahab does not leak at all. i know there is mixed reviews on the ahab and noodlers in general, but i have had really good luck with mine. i know there was some minor changes to them recently, i purchased mine in 2019, so that could be a part of it. but it is literally one of my absolute favorite pens. for 23$ you really cant beat it. the only thing i dont like is the smell! it reminds me of rubber worms for fishing...with that said, I opened the box, filled it up and it performed well, I didn't encounter any issues other than it ran dry after a half page or so, I widened the channel on my feed, learned to slow my pace down and haven't looked back. a great little pen!